Char bell pepper (if using fresh) and jalapeños directly over a gas flame or under a broiler until soft and charred all over, 12–15 minutes. Transfer to a medium bowl; cover with plastic wrap. Let steam for 15 minutes. To make harissa: peel, seed, and mince bell pepper and jalapeños. Combine peppers, chiles, garlic, and 1 tsp. salt in a food processor. Pulse, scraping down sides of bowl, to make a coarse paste. Pulse in 1 Tbsp. oil, lemon juice, coriander, and cumin. Season harissa with salt and black pepper. Place beans in a medium bowl; drizzle with remaining 2 Tbsp. oil. Season with salt and black pepper and toss to coat. Heat a large cast-iron skillet or other large heavy skillet over high heat. Working in batches, cook beans, turning occasionally, until blistered and charred in places but still crisp-tender, 6–8 minutes. (Or cook them in a grill basket on the grill.) 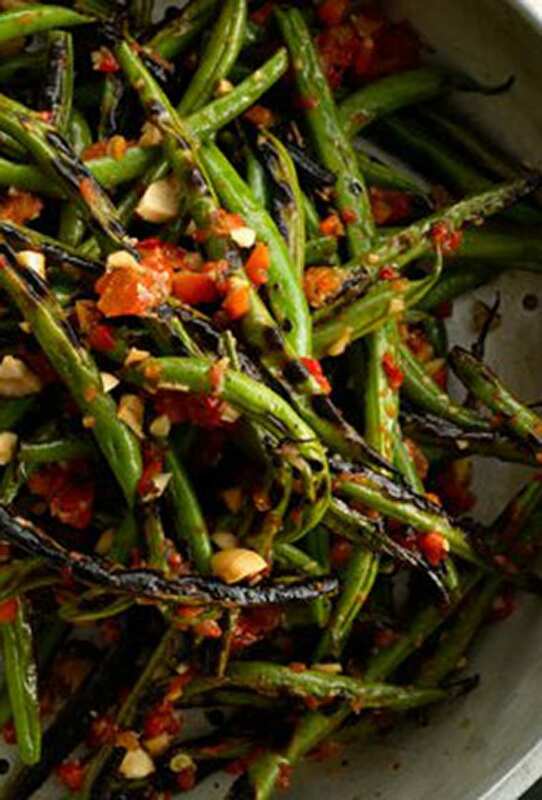 Transfer to a large bowl; toss with harissa and almonds. Serve warm or at room temperature.